In December, business leaders worried about a recession. According to the Duke University/CFO Global Business Outlook, 48.6% of U.S. chief financial officers believe the nation’s economy will enter a recession by the end of 2019. The Federal Reserve raised interest rates but noted an increase in economic risks. Fed Chair Jerome Powell hinted the Fed might start cutting rates soon. Somehow, everyone seemed to forget about all that when the stock market rallied in January. But they should remain worried. Indicators tell us a recession is likely. And it’s likely to start this month. In the past, recessions began in the month when the unemployment rate rose 0.4% from its bottom. Unemployment fell to 3.7% in November. The trigger for a recession is 4.1%. It was 4% in January. On average, the trigger follows the bottom by eight months. But it’s ranged from as little as two months to as many as 17. You might wonder why no one at the Fed noticed this. Chances are high they did. The Fed became concerned about a recession and changed policy in the past few months. You might wonder why other analysts ignore this indicator. That’s probably because it didn’t work well recently. The last three signals were early. Recessions followed unemployment-rate lows by an average of 13 months. But interest rates were in long-term downtrends at those times. When interest rates are in long-term uptrends, recessions followed the bottom in unemployment by just six months. That’s where we are now. Interest rates bottomed in July 2016. They almost doubled since then. Of course, this is just one indicator warning of recession. Another one is my Recession Watch Indicator. The Fed triggered that in December 2016. The indicator has an average lead time of 17 months. It points to a recession starting by the second quarter of 2019. 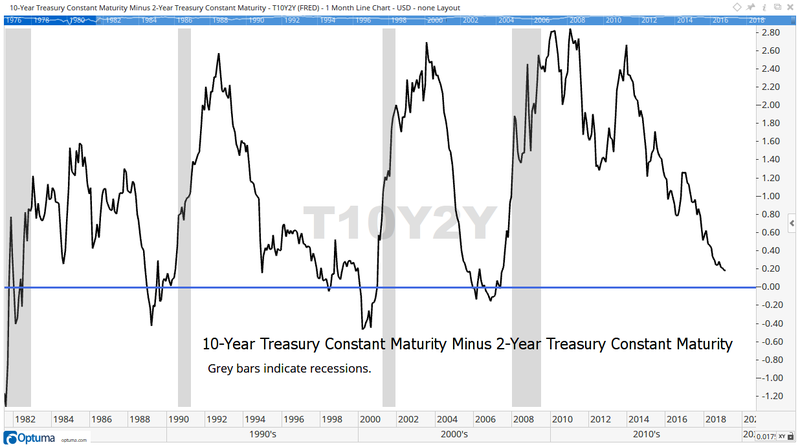 The yield curve also continues pointing to a recession. The yield curve shows the price of money over time. It charts the difference between interest rates on bonds with different times to maturity. A popular yield curve is the 10/2, which compares the yield of the 10-year Treasury to the 2-year Treasury. Yields on the 10-year are usually higher than yields on the 2-year. That’s because there’s more risk that things can go wrong over 10 years than there is in two years. When the 10-year yield falls below the 2-year yield, the yield curve inverts. In the past, that meant investors were worried about the short-term outlook for the economy, but they were still confident about the long term. The yield curve is at 0.16% right now, well below its 10-year average of 1.64%. The chart below shows that every time the curve fell this low, it eventually inverted, and a recession followed. This cluster of indicators confirms the stock market’s message. Stocks peaked in October. The peak usually occurs about six months before the recession begins. That points to an April start date. All these indicators only provide approximate forecasts. But they all agree: The next recession is starting soon.